Monsters range from level 170 to 175 and gives 20% of the regular EXP. Storyline quests of Kritias cleared and unlocked the Daily Quests. Monsters range from level 182 to 210 and gives normal EXP. Can join in the bi-hourly Kritias invasion to fight against the forces of the commanders (Hilla, Arkarium, Magnus and Von Leon). 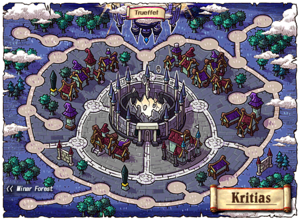 The monsters are used for daily quest purposes and maybe high-level training purposes (since the Kritias shop sells EXP entropy which gives 50% more monster EXP, which work only in Kritias). Sky Nest I from Leafre, which brings you to Frozen Path 2. Veritas/Pantheon/Shanghai portal to Market in Kritias. Walk to Frozen Path 2 and entering the left portal to exit to Sky Nest I in Leafre. All equipments are Untradeable permanently and no scissors can be used. Wear all 3 items for 20% increased damage to boss monsters and 20 Weapon and Magic Attack boost. All Gloves are Untradeable when bought and Platinum Scissors of Karma can be used to allow trading once. This can be easily classified as the best pocket item in the game. It has unique characterstics (which is why it has its own section). You can feed Anti-magic to the Inverse Codex by talking to Ravian. Methods to obtain Anti-magic are seen here. You must be wearing the Inverse Codex to feed it with Anti-magic, where 1 Anti-magic = 1 EXP. The Inverse Codex starts off with All Stats +2 and Weapon and Magic ATT +2. Stats can be increased with its level. However in exchange you have to feed 12,975 Anti-magic daily to maintain the maximum level and its stats. To acquire anti magic and anti magic stones, you have to participate in activities in Kritias. Note that you must have an Anti Magic Condenser to collect anti magic (except for invasion rewards). Every day, you can do daily quests (which must be completed in a certain order). There are 3 daily quests. Note that you have to do the quests outside invasion times as invasion monsters will not count in any of the quests at all. These involves either level 182 to 190 frozen series of monsters or Level 200 low level wizards. They reward 810,000 EXP and 1,200 anti magic each (given as an Use item, so if you have AMP entropy active, it will give 1,800 instead. Does not count towards the daily limit). You must have the Anti Magic Condenser to absorb the half magic or else you will not be able to double click to use it. Kill 50 of each monster in the frozen series. Kill 50 of each monster in the frozen series and collect 100 frozen energy (quest item). These involves either the burning series of monsters (Level 192 to 200) or mid-level wizards (Level 205) They reward 1,220,000 EXP and 1,800 anti magic (given as an Use item, so if you use it while AMP entropy is active, you get 2,700 instead. Does not count towards daily limit). You must have the Anti Magic Condenser to absorb the anti magic or else you will not be able to double click to use it. This quest is the hardest of all if you are low levelled and unfunded. They involve either the permeating series of monsters (Level 202 to 210), high level wizards (Level 210) or possibly lower level wizards below it, or all monsters in Kritias (except invasion monsters) They reward 2,440,000 EXP and 1 Anti-magic Stone (etc item). If you are not trying to exchange for Kritias Commemorative Coins, you can skip this quest since it does not reward any anti magic. Kill any monsters in Kritias (excluding invasion monsters and wizards) and collect 200 Frozen Energy from the frozen series, 200 Burning Energy from the burning series and 200 Seeping Energy from the permeating series. This is the bi-hourly invasion. Based on server time, every 2 hours, with the first invasion starting at 8.01am and the last invasion starting at 10.01pm, 2 of the commanders will invade Kritias. Time limit is 35 minutes, including 5 minute preparation time after the notice is sent out to eligible members for the members to travel to Kritias. When the invasion timer counts down to 29:59, everyone in Kritias who is at Set B maps will be channelled to a specific channel depending on server (Channel 18 for GMS, Channel 7 for MapleSEA). However, you can change channels inside. Invasion ends once the commander dies (virtual health of commander is 0 or negative) or when the time reaches 00:00, whichever's earlier. You cannot sit on chairs during invasion. "What if I came late?" You will be automatically channelled to the invasion area and channel when you enter Kritias while the invasion is still on-going. You can still participate in the invasion just that if you come on time, you will have more time for your missions and you will end up killing more monsters also, so your contribution is higher. However, if you are late you can still join the invasion just that you have lesser time to clear your missions and to gain contribution, which in serious cases if you still have 0 contribution when the invasion ends you are not eligible for rewards. "What if I left the map or disconnected during invasion?" If you join back before the invasion ends, you can still continue as per normal and your records will still stay. If the invasion ended, you can go to Brundel at North Barracks to receive your rewards as per normal before the warning for the next invasion is sent 5 minutes before the start of next round. The commander has a virtual health of 100,000,000. At monster areas, instead of the usual monsters, it will spawn monsters under the commanders instead. These monsters are Level 190 and has ranging HP of around 30 to 40 million. They reward about 115 to 125 thousand EXP. However less people train here due to its worse EXP ratio. Killing regular monsters in the invasion maps (approximately 1% chance at 1x drop rate) and pick up a Black Mage's Token (looks like a black ball). Deals 10,000 ~ 400,000 damage. Complete a mission from Brundel at the North Barracks. Deals 500,000 ~ 1,000,000 damage. Lower the virtual health to 0 before the 30 minutes is up to win! If the commander still survives after the timer reaches 0, you lose! The missions are relatively easy, especially when the commanders are Hilla and Magnus (unless one of the commander is arkarium). These deal a very stable damage to the virtual health, thus it can be used to obtain the final shot to the commander before it dies. Once you completed a mission you can accept another one immediately (you can get back the exact same mission as before). If you forfeited the mission (by quitting the quest using quest log), you have to wait for 1 minute (counted from the time you accept the mission) before you can take another one again (and even then you can get back the same mission). This rule does not apply if you have a mission that you received from previous invasions and have yet to be completed. Note that if you have a completed mission from previous invasions but you did not clear it, if the mission involves killing monsters only, you can clear it for the next invasion for instant damage but if it involved item collection, the mission will be rejected (but items will stay with you so if you receive the mission again you can clear it instantly). Here is the rough guideline of the missions. Note that for item collection quests, they are much easier to complete than monster killing quests since monster spawn is random and gets worse with a greater variety of monsters. Collect 1 part of a bone (specified) from the skeletons. Skeletons will drop a bone, which when picked up will have a chance to give you the quest item. If it is found to be a different part or when your etc inventory is full, you will receive nothing, so do not worry about it flooding your inventory. Collect 3 mysterious powder from Ghost of Aswan in invasion. Collect 1 letter handwritten by Magnus from the spectors. Collect 10 spector meat from the shorter spectors. Collect 8 toxic juices from the taller spectors. Collect 2 spears from the Vultures, 2 walls from the Mini Castle Golems and 2 bombs from the Bearwolves. 3 Master Monsters within the whole of Kritias monster maps in that channel. 1 will be spawned at a random monster map that contains at least 1 player if the maximum population is not hit every spawn interval. More than 1 master monster can spawn at the same map. They have 1 billion HP and rewards 200,000 EXP when killed. It will also drop 2 Black Mage's Token at a 100% rate (individual drop) and is unaffected by drop rate increments. When the virtual health drops to 25% or less, this is when the commander gets desperate and starts to appear in Kritias and kill you. Brundel will say "I have received reports that the Commanders will be taking over the battle! Be on your guard!" It behaves almost exactly as hard mode bosses (including meteor bombs and zone system but excluding sleeping gas for Magnus). When you die, you lose full EXP so it is recommended that you run away. When the bosses are killed, note that the invasion will not end. Instead it will drop 6 Black Mage's Token (individual drop). Only the other commander (not stated in the Invasion UI) invading can spawn (and once it dies, it will not respawn). They have about 6.3 billion HP. You do not need to kill these on-site commander monsters to win. In fact killing them does not ensure an immediate win also (it just drops 6 Black Mage's Token to damage the virtual Commander). You just have to deplete the virtual health of the commander to 0 to win. Your contribution is the total amount of damage done to the virtual health of the commander in that invasion session. Maximum half magic is 1,000 per invasion session and does not count towards the daily 10,000 half magic limit and is unaffected by AMP entropy effects. You can hunt monsters in Kritias at any time (Including invasion timings). These monsters have a low chance to drop a fragment of anti magic (including invasion monsters). The chance is estimated to be around 2% at 1x. When collected, it is used immediately (10-20 per fragment, additional 50% if AMP entropy is used). The base amount counts towards the 10,000 anti magic limit while the 50% additional from AMP entropy is not counted towards the limit. You must have the Anti Magic Condenser to collect the anti magic, otherwise you will receive 0 Anti magic upon picking up. The 50% boost is based on the base amount obtained, so if you hit the limit already and obtained 0 anti magic from the ground, the 50% boost will be based on the base amount obtained, which is 0, so the boost will also be 0. The acquired anti magic and anti magic stones can be used to synthesise into coins. You can synthesise anti magic and anti magic stones into coins by talking to Ravian in Lenheim, Academy of Magic. You can check the amount of Anti Magic Points that you have by double clicking on your Anti Magic Condenser. Note that if you threw it away, your anti magic will be retained, so do not worry about throwing it away in the case of an emergency freeing of inventory (such as Elite Boss). However you will need to buy another one for 5,000 mesos. 700 anti magic is needed for an Enheim coin. Anti magic stone cannot be broken to form anti magic, and neither can you fuse anti magic to form anti magic stones. You cannot break the Enheim coins and Kritias coins to form Anti magic or Anti magic stones. This page was last edited on 31 December 2018, at 07:26.